Has an enhanced 7-pin lead frame. 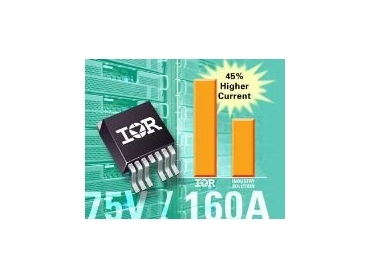 INTERNATIONAL Rectifier (IR) has introduced the 160A-rated, seven-pin IRF2907ZS-7PPbF, expanding the IR family of high performance 75V and 100V Hexfet synchronous rectification MOSFETs. The 160A rating provides an additional safety factor against surge current in switching applications. Typical applications include server switch mode power supply (SMPS) rectification with 12V output, active O-ring for telecom 48V rails and 24V input dc-dc converters. A standard three-lead D2Pak is limited to approximately 100A, depending on lead cross-section and manufacturer's specification method. The new IR device has an enhanced 7-pin lead frame that allows larger diameter wire-bonding, enabling the IRF2907ZS-7PPbF to achieve a 45% higher current rating than other D2Pak Mosfets on the market. In addition, the IRF2907ZS-7PPbF has a device on-resistance of 3.8mΩ, which is at least 16% lower than similar Mosfets on the market. "The high current capability of these new Mosfets enables a 20% power density improvement or a smaller component count than competing solutions and enables higher reliability designs," said Marketing Manager for ac-dc Products at International Rectifier, Stephen Oliver. The new high-current switching devices are also suitable for low voltage motor drive applications. In addition, the devices are RoHS lead-free, qualified to Q101 grade and moisture sensitivity MSL1.